Is the winter of Europe's discontent coming to an end? 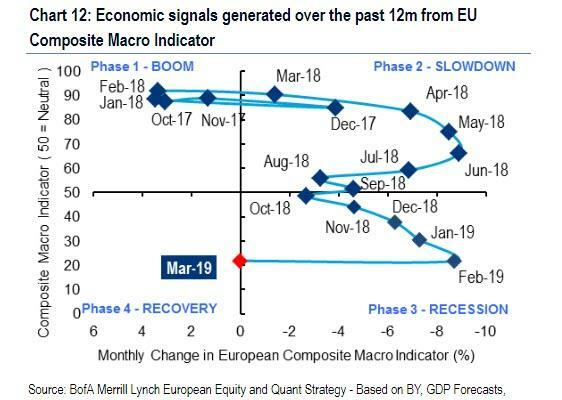 After a long period of economic pain which many believe culminated in Europe's descent into recession just as the ECB's QE of public bonds came to an end, in a note titled "Spring is coming" and focusing on events in Europe, Bank of America writes that its EU Composite Macro Indicator (CMI) avoided a decline for the first time in 12 months. Although the Style Cycle remains in the 'Recession' phase, improvement next month would lead to risk-on rotations within EU equities from May onwards. As BofA adds, Jan and Feb this year both saw all 6 inputs to the CMI contract. This was a unique event in the Style Cycle's history, reflecting that European macro was hurt by both domestic and global factors. The picture is significantly better this month amid global central banks pausing on tightening and corresponding narrowing in credit spreads. The EU OECD Composite Leading Indicator improved and Global EPS Revision Ratios are no longer falling, while 10y government bond yields are falling at a much slower rate. The bank's conclusion: while the CMI has stabilised, stronger signals in April will be needed to confirm 'Recovery'. Morgan Stanley agrees, and in the bank's Sunday Start report, Graham Secker, chief European equity strategist, writes that "Europe Looks Set to Surprise on the Upside." 7bp and we’ve seen the longest run of persistent European equity outflows in a decade – 50 weeks and counting. The latest ECB meeting provided little comfort as the central bank made significant cuts to its growth and inflation projections while pushing its forward rate guidance further out. While this may not seem an ideal backdrop to turn more positive on the region, we think that the gloom is overdone and Europe looks set to surprise on the upside. From a domestic standpoint, the idiosyncratic issues that weighed on growth in 2H18 are now starting to fade. Consumer confidence is rising again in France as the gilets jaunes protests lose much of their intensity, and the German auto sector is showing signs of recovery, with both order intake and passenger car registrations rebounding strongly in the last couple of months. In addition, financial conditions across the euro area have eased dramatically over the past three months, wage growth continues to climb and our economists project that 2019 will bring the largest fiscal stimulus the region has seen since 2009. Looking beyond domestic considerations, we believe that a fair share of Europe’s slowdown last year was ‘made in China’. The sharp drop in growth there weighed heavily on Europe, given its sensitivity to trade and exports, and we would caution investors not to underestimate linkages between the two regions. 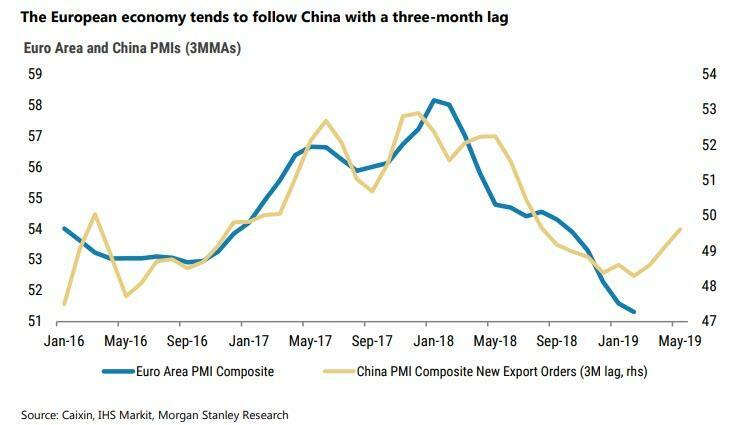 In a recent report, we highlighted that the China PMI new export orders series leads the euro area PMI closely by about three months, while China credit growth tends to be a solid predictor of Morgan Stanley’s European EPS growth lead indicator. Perhaps most striking of all, we found that European banks’ relative performance has correlated more closely with Chinese bond yields than European bond yields over the last five years! Hence our bullish call on China suggests a better outcome for Europe in the months ahead. To sceptics on Europe, this may sound like a rather large dose of wishful thinking, but we’ve already seen better euro area retail sales and PMI data for February, implying that January marked the trough for data in this mini-cycle. Given the depth of poor investor sentiment towards the region, any confirmation that growth is rebounding is likely to have important and positive implications for asset prices. With CFTC data suggesting that positioning in EUR is close to a three-year low, we are bullish on EURUSD and target a rebound to 1.18 by the summer. With yield differentials close to record wides, we are underweight European government bonds relative to North American bonds and still see scope for Bund yields to reach 50bp by year-end. And with relative valuations close to an all-time low, we also prefer European equities to US equities. We note that post a trough in the euro area PMI, the average increase in European equities over the subsequent six months is 9%. A more positive view on the European macro backdrop naturally leads to the question of whether European banks can start to perform better. While there’s no escaping the fact that monetary policy in the euro area is likely to remain a hindrance to the sector for some time to come, this is not new news and arguably is largely ‘in the price’. With banks’ relative valuations down to levels only seen at the end of 2008 and in mid-2016 (when Bund yields were negative), we think that any positive inflection in economic data, bond yields or Brexit newsflow could spark a tradable rally in one of the most depressed and unloved sectors globally. More broadly across the European equity space, we are positive on stocks with high China exposure, domestic UK names and ‘cyclical cyclicals’, where we believe that relative valuations are much too low.